Nov. 28, 2017 - Just over 10 years ago—August 7, 2007, to be precise—Lone Wolf was released. 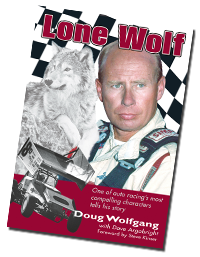 The highly-anticipated autobiography of sprint car superstar Doug Wolfgang, the book made an immediate impact on readers throughout the motorsports community. Featuring a frank and candid dialogue from one of racing’s most interesting characters, the book offered an unflinching glimpse of the powerful and complicated forces that come into play during difficult life episodes. A decade later the book remains as compelling and relevant as ever. As a story, Lone Wolf has enjoyed a unique staying power, continuing to appear on Christmas wish-lists of racing fans from across the nation. It has allowed a new generation to learn about the man who had an enormous impact on sprint car racing. Throughout his spectacular career Wolfgang had a knack of deflecting any praise directed his way, and perhaps that is further reason people were drawn to him. To this day, the Sioux Falls, South Dakota native tends to step away from the spotlight. Lone Wolf is more, however, than simply an enjoyable read. There is something within those pages that has drawn people in and left an enduring impression. Those close to the publishing industry long ago recognized that some books are much more than a gathering of bound pages. “Every so often we get a call and this guy says, ‘This is Doug Wolfgang out in South Dakota. Do you remember me?’” says Lew Boyd of Coastal 181, one of the nation’s largest dealers of motorsports books and literature. “We laugh every time he calls us…how could anyone ever forget Doug Wolfgang? Ten years later, Lone Wolf is still going strong. The legend of Doug Wolfgang rolls on.